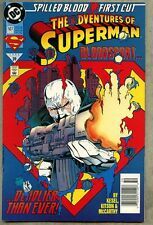 ADVENTURES OF SUPERMAN #507 BLOODSPORT DC 1993 NICE!!! The Adventures of Superman #507 - Spilled Blood First Cut "Bloodsport!" 1 product rating - The Adventures of Superman #507 - Spilled Blood First Cut "Bloodsport!" This page was last updated: 19-Apr 22:04. Number of bids and bid amounts may be slightly out of date. See each listing for international shipping options and costs.